More and more guests are traveling with their laptops, smart phones and tablets. Guest Portal is the first website the guest will see when connecting to the Internet at the hotel. Developed with the in-house guest in mind, the hotel provides updated information, events, activities and promotions to generate additional revenue. Optimized for mobiles and tablets. Boost your sales by promoting your restaurants, spa, meeting rooms and other services your hotel offers to your guest in-house or send the link to future guests. Promote your own timeshare development and other Hotels in the chain. Use your Guest Channel promotional videos! With our advanced system, your hotel may easily make changes to the information, update promotions, restaurants hours and Spa details. Promote theme parties and special events. Designed to work with all operating systems and automatically scale to fit any screen size. Usage statistics of the Guest portal to know what the guest visits most in the Guest Portal. Your hotel may sell advertising in its Guest Portal, generating a new source of income or reducing/eliminating the cost of this service for your hotel. Contact us now to learn more about our Guest Portal service. 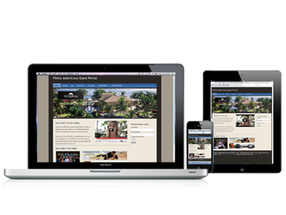 See an example of a 100% operational Guest Portal.